"It's proof that some denim really is just born that way," Steven B. Wheeler, lead designer at Betabrand, says in this promo for the fashion company's Gay Jeans. What's cool about these pants is that when they are broken in, they reveal "brightly colored, rainbow-hued yarns underneath." While Betabrand's rainbow denim may not be the first in its class, it's certainly the most philanthopic. Ten percent of proceeds from the crowdfunded project will be donated to the San Francisco LGBT Center. 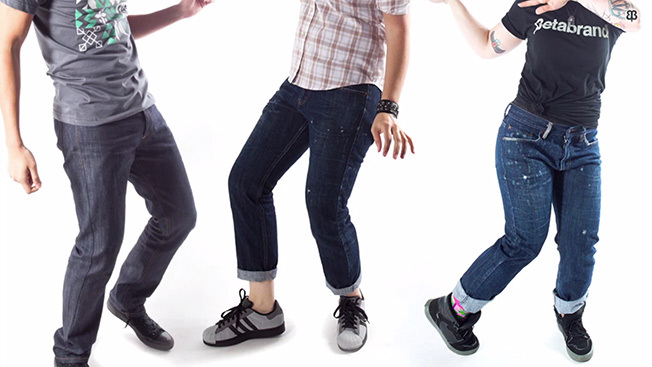 Ame Corwin, advanced materials researcher at Betabrand, says on the website: "We hope Gay Jeans will help end generations of exclusion and unfair treatment for atypical denim. All jeans deserve equal rights, regardless of color, creed and fiber content." If you'd like to order a pair of Gay Jeans, go to the site and drop $88 for "Slim-Fit" or $78 for the "Stretch-Skinny." Are you straight? Don't worry. You can wear them, too. Gay Jeans won't make you gay anymore than "driving a Toyota will make you Japanese," the brand says in its FAQ. "If you put on a pair of Gay Jeans and begin experiencing gayness, chances are it's because you are gay."